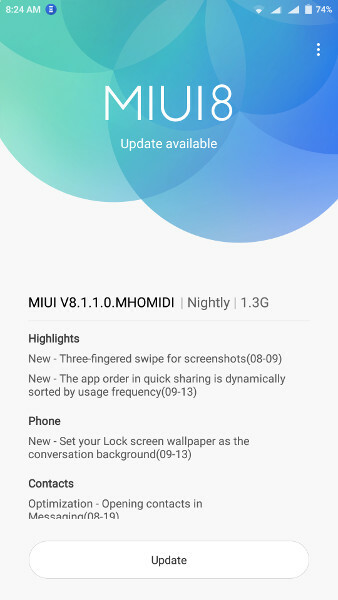 Xiaomi has started rolling out Android 6.0 (Marshmallow) update for the smartphone along with the MIUI 8.1.1.0.MHOMIDI OTA update as nightly build, which Xiaomi calls Beta-Stable release before the final update. 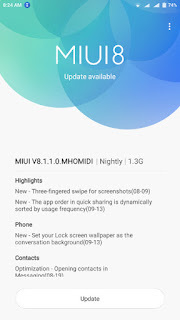 The changelog of the update some additional bug fixes and optimizations. The update is about 1.3GB in size and is available for select users randomly. A stable build is expected to roll out for all the users soon after the test is complete. Redmi Note 3 feature a 5.5-inch (1920 x 1080 pixels) Full HD IPS display powered by a 1.8 GHz Qualcomm Snapdragon 650 HexaCore processors with 3GB RAM .Redmi Note 3 has a Hybrid Slim slot. Which means you can use one Micro Sim + Nano Sim or One Micro Sim + Micro Sd card. Redmi Note 3 has16-megapixel rear camera with f/2.0 aperture, LED flash and phase detection auto-focus (PDAF), resulting in a quick focus of just 0.1 second and 5 MP front facing camera . Connectivity options include 4G LTE, Wi-Fi 802.11 ac/b/g/n ( 2.4 / 5GHz), Bluetooth 4.0, GPS + GLONASS. packed by a 4050mAh Battery.